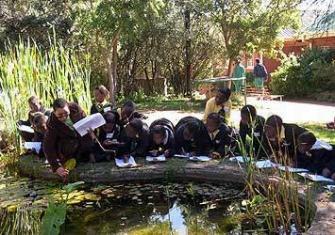 Up to 3700 learners per year attend lessons facilitated by our experienced team of environmental education officers. The lessons are fun, hands-on and offer learners an opportunity to interact with nature in a very personal way as they are encouraged to discover the environment through careful observation, recording and interpretation of data. School teachers accompanying their groups into the Garden are exposed to practical activities which can be used in their own school gardens or neighbouring natural areas. Lessons are offered to learners with a range of special educational needs. Each lesson is adapted to meet the needs of each specific group. Lessons are offered in English, SeSotho and isiXhosa and special lessons are facilitated in celebration of Environmental Days/ Weeks. Bookings should be made a month in advance, with the Administrative Clerk Mabelo Matsie on +27 (051) 436 3530 or Fax: +27 (051) 436 1867. A booking form will be sent to you via fax or email. Complete and return the booking form, making sure to indicate your choice of lesson. A 50% deposit is required to secure the booking. The Garden has a restaurant that sells light snacks. Developing Indigenous gardens in schools is a way of extending the classroom to the outside where you can utilise the garden as a learning resource. This programme is also aimed at raising awareness and creating environmental responsibility at schools. This programme aims to establish indigenous, water-wise gardens at schools. 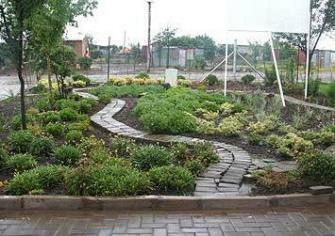 It also teaches the learners and teachers basic horticultural skills through a series of workshops. Up to date 57 school gardens have been developed around the Free State through this programme. Due to a lack of funding we are currently only greening one school. – Each school establishes a Green Team to champion the project. Ideally a ‘Green Team’ consists of educators, learners, community members and the school’s groundsman. – The Green Teams attend a series of horticultural workshops and learn about various aspects of garden design, soil quality, planting, plant propagation and garden maintenance. – After each workshop, the Green Team of each school immediately implements what they have learnt back at school in a step- by-step process of developing their own indigenous garden. Regular site visits by the Outreach Greening staff members help to monitor each school’s progress. – The outreach Greening Programme provides the compost, plants, mulch and a toolkit of gardening equipment to each school. – In their second year on the programme, the schools are required to plan and implement an extension of their garden. – The educators attend workshops which build their capacity to create interpretation plant labels and storyboards for their garden. They are then required to develop curriculum-linked lessons that can be facilitated in their schools gardens. – Continued support is given to the schools as they maintain their gardens and use them as educational resources. – Schools are encouraged to initiate vegetable gardens and establish partnerships with various organisations that can assist them with their school garden. – Each school in the third year of the programme is required to plan and facilitate an Open-Day ceremony which celebrates their achievements and officially signifies the end participation in the programme.